Brighten and revive your blonde, grey or silver hair with the Balmain Hair Illuminating Shampoo - Silver Pearl. Specially formulated for cool blonde and silver hair, the illuminating shampoo gently cleanses while releasing pure violet pigments to neutralise warm, brassy and yellow tones. Restoring vibrancy and crystal clear colour, the shampoo refreshes, hydrates and corrects to leave locks looking bright and glossy. 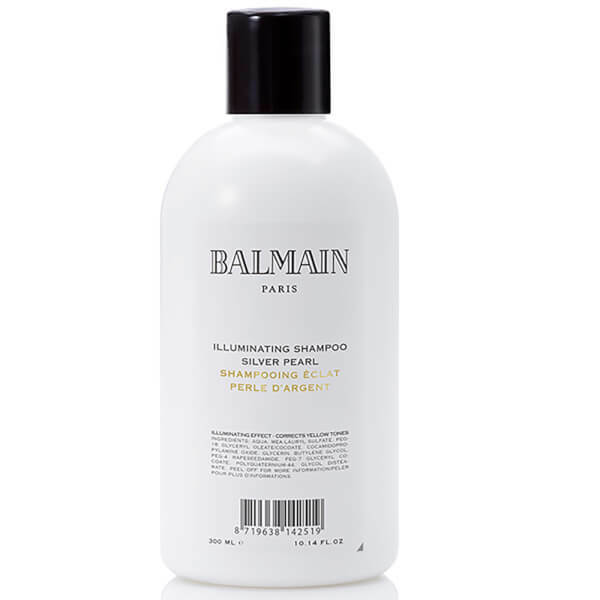 Although the Illuminating Shampoo Silver Pearl can be used to neutralise yellow or warm tones, it is most effective to maintain the correct blonde tone in between colour services. Apply to wet hair, massage softly and rinse out thoroughly after 3 minutes. Repeat the treatment until the desired result is reached. Due to the permanent brightening effect which can’t be washed out, excessive use is not recommended. Do not use the hair lightener on skin or clothes. Aqua, MEA-Lauryl Sulfate, PEG-18 Glyceryl Oleate/Cocoate, Cocamidopropylamine Oxide, Glycerin, Butylene Glycol, PEG-4 Rapeseedamide, PEG-7 Glyceryl Cocoate, Polyquaternium-44, Glycol Distearate, Glycereth-2 Cocoate, Sodium Laureth Sulfate, Tetrasodium EDTA, Benzophenone-4, Ethylhexylglycerin, Sodium Benzoate, Phenoxyethanol, Iodopropynyl Butylcarbamate, Citric Acid, Parfum, CI 60730.